Economics 10b: “Principles of Economics” is the most popular course in the Faculty of Arts and Sciences for the fourth consecutive spring, beating out the second-largest class—Life Sciences 1b: “An Integrated Introduction to the Life Sciences: Genetics, Genomics, and Evolution”—by a hefty margin of about 150 students. As of Tuesday, the introductory economics course had 571 students enrolled, while introductory biology course Life Sciences 1b had 414 enrollees. 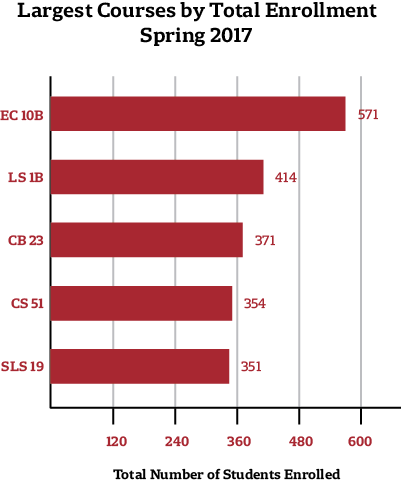 The numbers are relatively consistent with enrollment in these courses in the past: last spring, Economics 10b was slightly larger with 578 students, while Life Sciences 1b was smaller with 400 students. Some students said they were drawn to the two courses because they provide a foundation for future concentrations. “I’m considering pre-med and [Life Sciences 1b] is a prerequisite, so I’m taking the class so I don’t rule it out. I also took a lot of AP Science courses, so it’s been kind of a continuation of that,” Simone R. Dreux ’20 said. Rounding out the top five courses were Culture and Belief 23: “From the Hebrew Bible to Judaism, From the Old Testament to Christianity,” with 371 total enrollees, Computer Science 51: “Introduction Computer Science II”, with 354, and Science of Living Systems 19: “Nutrition and Global Health,” with 351. Statistics 104: “Introduction to Quantitative Methods for Economics,” the top-enrolled class in spring 2013, came in sixth place this year with 336 total students. Societies of the World 54: “Islam and Politics in the Modern Middle East,” taught by Islamic studies professor Malika Zeghal, saw a dramatic spike in enrollment this spring. Enrollment in the lotteried course increased by 127 percent from the last time it was offered in the fall of 2015, growing from 37 to 84 students. “We always expect a large number of students to be interested in this course on Islam and Politics in the Modern Middle East, since the topic speaks to contemporary major issues and events related to the political role of Islam in the Middle East and beyond,” Zeghal wrote in an email. Students have until Feb. 21 to add or drop courses, and until Feb. 6 to do so without a fee. —Edith M. Herwitz can be reached at edith.herwitz@thecrimson.com. Follow her on Twitter @edith_herwitz.